This is an action-packed book full of anecdotal adventure as the author takes readers on his journeys to find wildlife around the world. As a professional zoologist, his career has taken him to six of the world’s seven continents for research, photography, tourism or film-making. What makes this book really special is that Dan has also written about the people he has taken with him, the people they have encountered and the histories and politics of the countries in which they have worked. 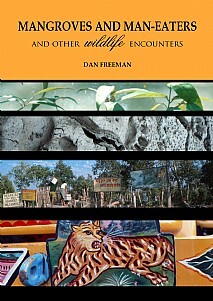 Thus, the man-eating tiger story also touches on human poverty and the impact of climate change on Bangladesh; the Australian grasswren story tells how Dan was exploited in his junior role in the Natural History Museum; the African safari covers a terrifying near-death experience with swarming killer bees during the reign of Idi Amin; the giant oak story is set partially in Ukraine, at a time when it was still coming to terms with its new identity following the break-up of the USSR. In ‘Bonding with Spiders’ Dan meets the original James Bond, the bird-eating spider from Dr No and has his own nightmarish encounter in the Australian bush, sharing his tent with a giant spider! Other stories include the battle between young lions and older rivals, filming piranhas in South America, tortoises in France, and wolves, bears and ibex in Italy. And just to show that wildlife drama takes place in our own back gardens, Dan writes about a male blackbird that survived an attack by a neighbour’s cat and then grew up to raise its young under the watchful eye of a local sparrowhawk. Complemented with line drawings by Robin Prytherch, this is a powerful and evocative collection of stories, the result of 45 years engaging with animals and people on six continents. Dan has observed his subjects with a naturalist’s passion for detail, resulting in a book that is engaging, informative and highly revealing. Although some of the creatures would make you want to run a mile, the book will be hard to put down! Bonding with spiders; Grasswrens from the north; Reef encounter; Point Torment; A safari to remember; Isobel Bennett; A Christmas camel; Tony and the last tortoise; Mangroves and man-eaters; The Italian job; Red-bellied piranhas; James and the giant oak; To and from the Puszta; Nzou of the buffaloes; The lions of Selinda; In the land of the dragon; Mr Blackbird; Sugar Mike Mike. This hugely enjoyable book will be of particular appeal to everyone with an interest in wildlife and the natural world.